Oddball Stocks: CIBL is undervalued again, is the valuation gap enough? CIBL is undervalued again, is the valuation gap enough? Getting to know a company is much like getting to know a person. At first two people are acquaintances, knowing surface level facts about each other. As the relationship develops those small facts and experiences add up and join with the person's character until each person knows each other, not just knows about each other. And just like when two old friends get back together and get up to speed quickly getting back up to speed on an old investment is similar. A reader mentioned in the comments somewhere that I should take a look at CIBL (CIBY) again. I posted about CIBL a year ago here. You're welcome to read the old post, but I'll do a Reader's Digest summary for those with limited time. CIBL was a spin-off from LICT, a Mario Gabelli controlled telecom company. Gabelli is on the Board of CIBL, and signaled to shareholders he was serious about realizing value for them. The company owned two TV stations in Iowa, and cell towers inside of a joint venture in New Mexico. The company's annual report repeatedly mentioned they had received an offer to purchase their cellular interests for a price greater than the company's market cap. Even with this explicit signal the efficient market failed to adjust CIBL's price upwards. The company did end up selling the wireless interests for a price that far exceeded the market cap, and the shares finally ran up. I ended up selling my shares when I received the proxy for the sale in the mail, I ended up making 50% on my purchase in a few months. I wish all my investments worked out that well and that fast, but if they did I wouldn't be writing this, I'd be sipping a drink by a pool somewhere tropical. Instead I'm sitting in my basement office at night scouring markets for opportunities, and writing about it. I enjoy this, but if someone is willing to offer me the tropical gig I'm all ears. A lot has happened since I sold my shares. The company decided to return cash to shareholders in the form of a dutch auction. The company offered to buy 7,000 shares of their stock at a price of up to $860 per share. Only 2,460 shares were tendered, so while shareholders were happy the company sold the cellular interests, they are also happy to let Gabelli make capital allocation decisions instead of themselves. After the dutch auction CIBL then went on a buying binge, they purchased 40% of ICTC Group (ITCG) which is another Gabelli spin-off from LICT. ICTC Group is a rural telephone carrier in North Dakota with 2300 lines and 600 DSL customers. The company also runs an ISP which services 1000 customers. The 40% interest was purchased in two parts, 20% was purchased as a private placement, and the second 20% was purchased through a tender the company offered to ICTC Group shareholders. Of all the things CIBL has done in the last year this is the one that fails the sniff test for me. Gabelli's company LICT spun-off both CIBL and ICTC Group, and now CIBL purchased part of ICTC Group back in a private placement. My suspicion is that CIBL was used to cash out Gabelli's position in ICTC Group. If this is true there might be a note in the annual report in a few months. The company also increased the authorization to buy back their own shares, and acted on that authorization. There are still a few shares available to buyback, but not enough to move the needle at this point. 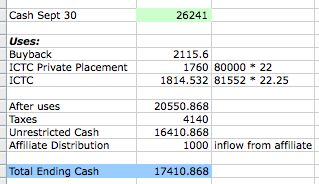 At the end of the year the company had $17.41m in cash available to use. Because the company is essentially a holding company they don't have any liabilities except for taxes. I reduced the cash balance by taxes the company is expected to pay out in periodic payments over the next year. Valuing the company is relatively easy considering they're not much more than a pile of assets. The company does have earnings from equity interests but only the relevant subsidiary should be valued on an earnings basis, not the entire holding company. The best way to value CIBL is a sum of the parts. The only piece of their holding that's difficult to value is their TV station interests. In my prior post I took a stab at valuing them based on the information in the annual report. After that post and upon further research I think my valuation of the TV stations was on the high side. The two stations earned $185k in the last quarter, but the company noted this was higher than normal due to political ad spending. The TV station interest is held on the balance sheet for $519k which is on the low side considering that $519k generated $185k in earnings. Based on the earnings the stations generated last year, and the low salability I took them at 4x of last year's earnings. This value might seem low, but there is some debt attached to the stations, and for indebted marginally profitable local TV stations I think a low multiple is appropriate. Based on this estimate CIBL is selling for 25% less than the sum of the parts. Most readers will spot that this valuation is extremely sensitive to the value of the TV stations. Purchasing at the current price gives the investor $965 p/s in cash and investments, plus the TV stations for free. While a valuation is sensitive to the value of the TV stations the biggest wildcard for me is what comes next. If CIBL was simply returning cash to shareholders and planning to sell the TV stations it would be very attractive at this price. Instead the company coffers are full of cash and management has indicated they are looking to make substantial acquisitions. If the company is a savvy acquirer with a competent manager CIBL could work out well for shareholders. My concern is that this isn't the case, they have acquired 40% of a marginal rural telco that isn't creating a lot of economic value for CIBL shareholders. The shares of ICTC Group were purchased below book value, but the company isn't contributing all that much in terms of earnings or cash flow. In other words CIBL took liquid cash, and tied it up into something that ultimately needs to be sold to generate value, the holding pays no dividends, and doesn't have much free cash flow. While the valuation gap is compelling, I've decided to wait this out for now. If CIBL drops significantly I would be a buyer once again, but for now this will have to wait. Always weary of management that wants to engage in empire-building or acquiring money pits!